It is August 7th as I begin to write this. 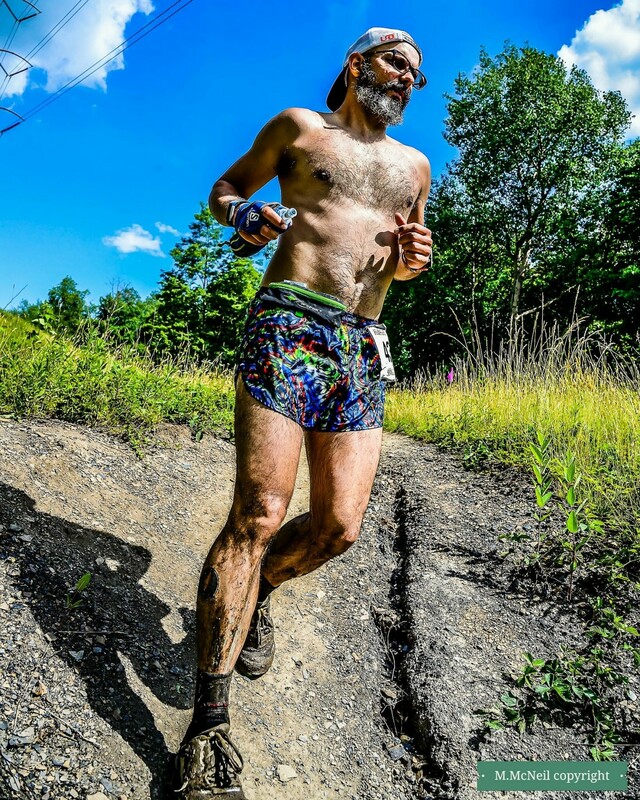 The Inaugural Youngstown Marathon was held on June 4th and the Hell Hath No Hurry 50 miler on June 24th. Since the 4th of June I found myself deep into work. I was out of town working 60 hours + a week and was a bit of a slacker when it came to anything else in my life, running included. Here I present to you what I can recall from these races. It may be that every word is true or that time has distorted truths into fanciful remembrances bordering on myth. I leave you to be the judge, I but a humble narrator. sipped my coffee at regular intervals letting the caffeine slowly ply my body and mind into wakefulness. A car pulled up. It was Chuck. He threw his bag in and we got on the turnpike with the goal of arriving at the Second Sole running store by 6:00 AM to pick up our packets and get ready. We arrived closer to 5:40. The race start would be at 7:00 AM. A number of friends from the Steel City Road Runners (SCRR) were present. It is always a pleasure to run a race within an easy drive of home. We got our SCRR group picture and walked across the street to line up for the start. My goal for the race was simple. I would run it. No lofty time goals, no real goals in mind except to enjoy the day. When the starting cue was given I was off running for the sheer joy of it. Well the “sheer joy of it pace” is almost always faster than the sustainable long haul pace. After the first two miles I was averaging a hair under 8:00 min/mile and feeling good. Let’s see how long this feels good. 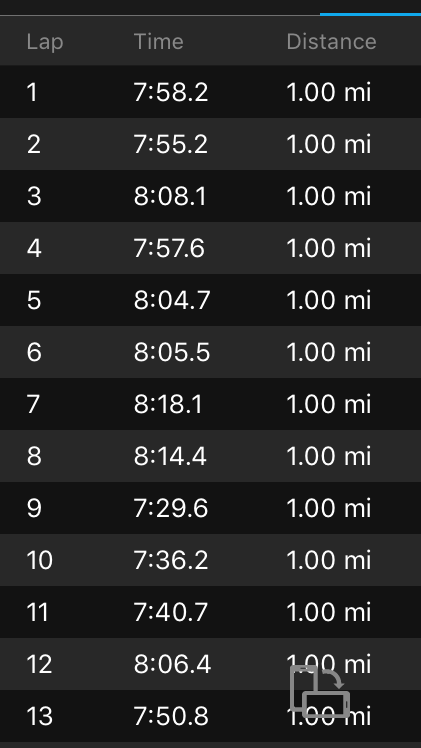 After 6 miles I dialed back to around 8:20 and then kicked it back up to the mid 7s for miles 9-11 cruising through downtown Youngstown enjoying the easy flat ground as much as the reactions from the spectators at my race kit. The second half of the course is the harder portion. There are some great hill climbs and my pace was all over the boards from here based on those hills. Still I pressed on until mile 22 with an average in the low to mid 8’s. Things were going great, but that hill at mile 22….well its a good climb for mile 2. It’s all the more challenging at mile 22. From here in I struggled to keep my pace in the 9’s. Coming into the final stretch I could see the finish line. A guy pulled along side of me and started to pull ahead. I dug in and tried keeping up. He was older, but he was definitely smoking me. We went back and forth until he finally said to me, “Stop playing and run!” I didn’t know I had much left in me, but when he said that a fire was lit in my legs and heart and I sprinted the last few hundred meters in. Looking at the clock I was only 3 minutes off from a PR! The PR time was set in the fall at Steamtown, a course with net elevation loss and few hills. The Youngstown course had around 1100 feet of gain. Needless to say I was happy, tired, and well sated with a 3:40:54. Hell Hath No Hurry is a series of races held each summer in Settler’s Cabin Park just outside of Pittsburgh, PA. The course consists of 10km loops with around 800-900 feet of gain per loop. Races held over the course of the day include a 10k, 30k, 50k, and 50 miler. Staggered start times make for a great opportunity to sleep in on race day (unless you are running the 50 miler). In the evening there is a BBQ with beer from a local brewery and good eats. The last two years Helicon Brewing provided libations to soothe the tattered legs and full hearts of runners. 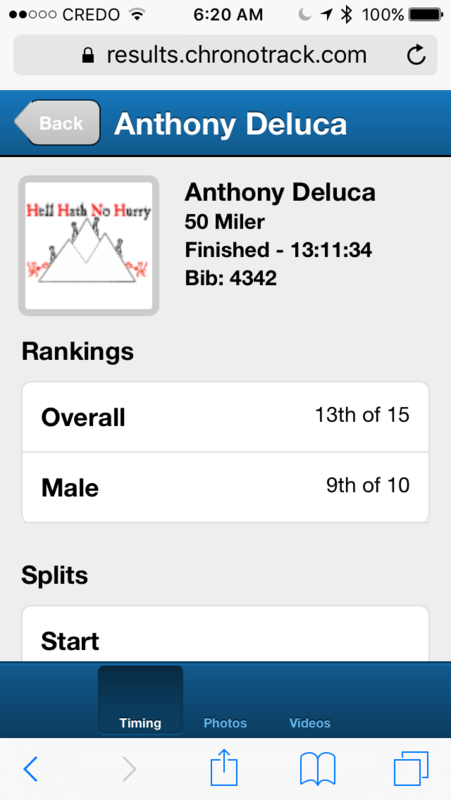 Last year the Hell Hath No Hurry 50 miler put the hurt on me. It was my second DNF ever (and second DNF in two weeks) and I vowed to get the job done the following year. While the course doesn’t have a huge amount of gain (around 7000 ft for 50 miles) the hills plus the heat this time of year always makes the races here difficult for me. While milling around and setting up my area (50k and 50 milers are permitted to setup their own stations near the start-finish line) I ran into a few friends. Terry, a Hammer Nutrition sponsored athlete, was there with Alicia and the kids. Patrick was there and offered to crew, which was a true blessing and cut down my aid station time considerably. The start time was at 6:00 AM. After Peter, the RD, gave a brief rundown of what to expect on the course we were off. The course ran clockwise this year making the first few miles easy. I ran in my Luna sandals without socks. It had rained considerably the day before the race and sections of the trail were fairly slippery. I found out early into the first loop my beloved sandals wouldn’t cut it. They don’t perform well in mud and soon I was slipping around with hot spots on my feet. After the first loop I changed into Altra Lone Peaks. If I have to wear shoes I wear Altras, though in a endurance race like this I would pay for it in blisters, something I rarely get in Lunas. No matter though. If one is to run very long distances then one must be prepared to endure some pain to complete the task. The first 4 loops went off fairly smooth. Slow, but smooth. My hydration and nutrition seemed to be on-point and I had built up a comfortable cushion against the 8:00 PM cutoff time. No doubt I would dib into that savings during the last 25 miles. weather. After many issues an many races I have learned a few tricks. I donned an ice bandana and increased my dosing of Hammer Endurolytes, an electrolyte capsule. This year’s course featured a section of asphalt. It was a fairly steep hill climb leading up to the mid-point aid station, which was manned by the amazing Coach Audrey and equally amazing fowl, but never foul Alyssa the Turkey, Wonder Woman Suzanne, and a few other volunteers. Usually the mid-point aid station had water, Gatorade, and maybe some chips or pretzels. A light , but efficient station. Well when Audrey puts on an aid station you can be sure it will be over the top with goodies. There was fruit, grilled cheese, and a number of other foods I can not recall. While stuffing my face a volunteer was on his hands and knees scraping mud off my shoes! Ultra runners and volunteers at ultras (this gentleman was both) are some amazing folks! Couple all those treats with the exuberance of Suzanne and Alyssa and one had an oasis to look forward to every few miles. 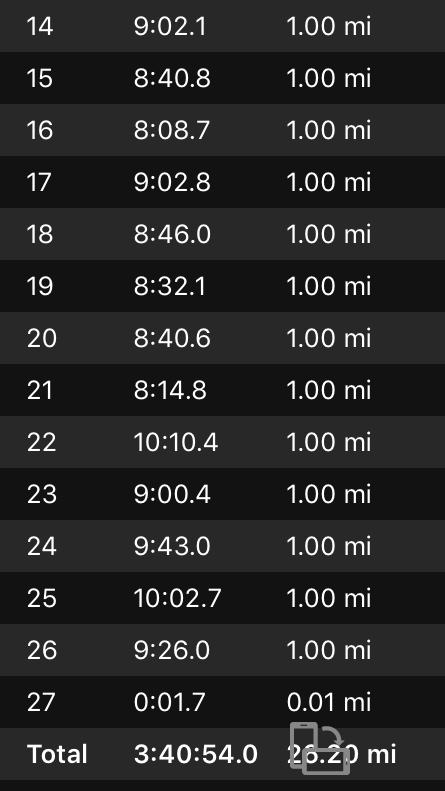 What were 13:00-14:00 minute average paces for the first 25 miles began slipping until I was averaging 16:00-18:00 minute miles. Still, I had plenty of time and needed only to keep moving. Constant forward motion and efficient aid station stops, mostly around 5 minutes. Leaving the midpoint aid station around mile 40 Scott came cruising by and we ran together a bit chatting. The section of the course leaving the mid-point Aid party featured shady pine forest and gentle descents which gladdened my legs and heart alike. Coming into the main aid station at mile 44 I had roughly 3 hours for 6 miles. Regardless how wrecked I felt I knew I could walk the whole thing if needed. It didn’t take 3 hours, but it did take a little over 2 for that last loop. I was one of the last finishers and this was my slowest 50 mile time yet, but it was done and I was sincerely happy. I came in with an official time of 13:11:34, the cutoff being at 14 hours. This evened up the count from my second ever DNF at the 50 mile race last year leaving the Laurel Highlands 70.5 and Oil Creek 100 on my DNF revenge list. Both will likely see my huarached-feet in 2018. I look forward to seeing some of you out there running and cheering!